We received dozens of insightful entries for our “Bank On Yourself vs. savings account” contest. They confirmed – once again – that we have a whole bunch of very smart subscribers! The contest even inspired one reader to write a poem! I’ve been studying these topics full time for nearly a decade now, and even I learned some new things. So, whether you use the Bank On Yourself method or not, or you consider yourself to be an expert or a novice at understanding money and finances, you should read this! You will undoubtedly learn some things you didn’t already know! There were so many great contest entries, it was really tough for our team to single out only the five best entries, and the winners of the iPod Touch, Amazon.com gift certificate and more are listed below. The contest question was: How is dividend-paying whole life insurance different from a savings account, besides the death benefit? Our readers gave a dozen or so distinct, key differences between the two, and I’ll summarize a number of them in a moment. Many retirees today can’t stomach the volatility or unpredictability of investing in stocks and other traditional investments and were counting on their interest income from CD’s, money markets and savings accounts. There have been a spate of articles in the financial media recently encouraging retirees to catch up on savings shortfalls by investing as much as 40-60% of their nest egg in the stock market. These “experts” promote the concept as if it makes perfect sense to make up for your gambling losses by doubling your bets. To me, it’s appalling that anyone would advise those who are already retired to gamble their life’s savings on the volatile, risk-filled world of Wall Street. But my message – that Wall Street is unstable and potentially as explosive as nitroglycerin – is really not age specific. The stock market can (and will) blow up in your face at any age. For most Americans – and Wall Street goes to great lengths to hide this truth – the stock market is a promise unmet. The success myth hyped by the financial services industry is like a casino showcasing its big winners, without mentioning that the prize pool derives from the much larger pool of losers who generate huge profits for the operators, but who themselves walk away worse off than if they had stayed at home. To find out how much your financial picture could improve if you added Bank On Yourself to your financial plan, request a free Analysis. If you’re wondering where you’ll find the funds to start your plan, the Bank On Yourself Authorized Advisors are masters at helping people restructure their finances and free up seed money to fund a plan that will help you reach as many of your goals as possible in the shortest time possible. James Rick, also known as “Mr. Full Potential,” is the founder of FullPotential.com and author of “Unleash Your Full Potential.” James is a lifestyle strategist for living your best life, cutting costs and building wealth through what you love! So check out his other terrific interviews! Since the financial crisis, and until very recently, individual investors (that’s you and me) largely avoided stocks. But now, as the stock market continues on a sharp rise that is already one of the steepest in history, people begin to fear they will miss out. According to a recent article in the Wall Street Journal1…. Just as they did before the housing bubble burst and just like they did before the dot.com crash. And just like they have done throughout history. How can you be sure they’re not about to do it again? When opportunity knocks, will you be ready? In every economy – whether boom or bust – opportunities arise. Unfortunately, most people don’t have the financial resources to take advantage of them. Take Joni and Dave Schultz, who just happen to be my sister- and brother-in-law. Joni is a hospital department supervisor and Dave just retired from his job in construction. Joni and Dave started a Bank On Yourself policy about five years ago, in order to supplement their retirement income and add predictability to their financial plan. But they’d never used it to finance any purchases… until now. Hold your financial course or change your course? The Dow has dropped below 10,000 several times recently – a level it first reached more than eleven years ago and has since bounced over and back an astonishing 63 times! Millions of people who were counting on their homes to help fund their retirement now have no equity to count on, because they owe more than their homes are worth. Credit is still extremely tight for both businesses and consumers, underscoring just how little control we have when we have to rely on other people’s money. As we face continuing economic challenges, many people are wondering… what does the future hold? How will the debt crisis affect Bank On Yourself? A question we are getting frequently right now is how safe is your money in a Bank On Yourself plan if the debt crisis in Europe continues and spreads to the United States? Life insurance companies are highly regulated and required to maintain sufficient reserves to ensure they can pay all future claims. They are regularly audited by the state insurance commissioners’ offices, and sometimes by dozens of states, to ensure they are on solid financial ground. And a multi-layer safety net exists to assure your money in a life insurance policy is secure. You may be wondering, “What about AIG?” Many people missed the fact that AIG’s problems were caused by a holding company, not its life insurance subsidiaries. Their insurance companies were walled off from the problems, have always been solvent and did not receive a bailout. The companies recommended by Bank On Yourself Authorized Advisors are among the financially strongest life insurance groups in the world. They enjoy some of the strongest surplus positions in the industry, approximately double the industry average. These companies are, in essence, owned by policyowners, rather than stockholders, which allows them to focus on the long-term interests of policy holders, rather than the short-term demands of Wall Street. I thought you might find it helpful to have the answers to the six questions about Bank On Yourself we’re most often asked – right at your fingertips. How many of these questions have you been wondering about? FAQ #1: How does Bank On Yourself compare with traditional investing and savings strategies? You can compare the Bank On Yourself method to traditional investments here, including stocks and mutual funds, a 401(k), a ROTH plan, real estate, gold, commodities and several other investments. If there’s a different financial product or strategy that you think can match or beat the Bank On Yourself method, I encourage you to take the $100,000 Challenge. If you’re right, you could pick up an easy $100K! FAQ #2: How does Bank On Yourself let you recapture every penny you pay for major purchases like cars, vacations, business equipment or a college education? I’ve summarized this in a short video overview of how Bank On Yourself works. However, for a more detailed explanation, you’ll want to review Chapters 2, 6, and pages 52-54 of my best-selling book, Bank On Yourself. If you don’t have the book, we offer a 35% discount on it. FAQ #3: I’ve heard people like Dave Ramsey and Suze Orman say whole life insurance is a lousy place to put your money. Is a Bank On Yourself-type policy different from the kind they’re talking about? 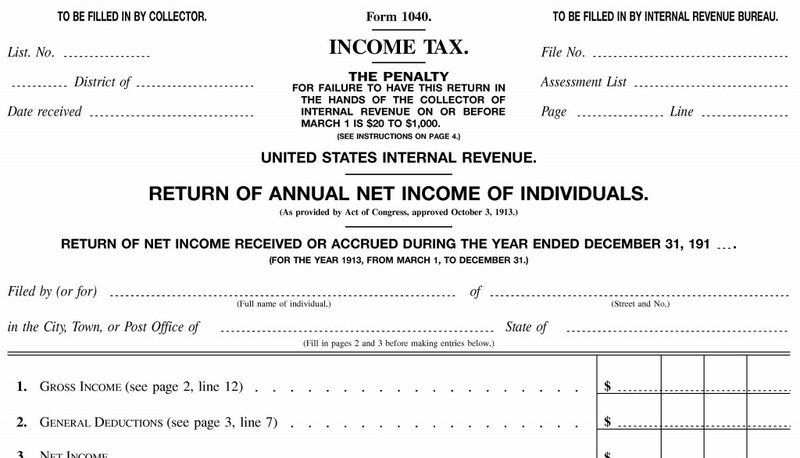 Did you know that the U.S. income tax was first instituted in 1913? I recently came across a copy of the very first IRS Income Tax Form 1040 our forefathers were required to file and wanted to share it with you. What percentage of taxable income do you think the average family paid back then? What was the top percentage paid by the very wealthiest Americans? How many pages long do you think that first tax return was? How many pages were the instructions needed to complete the form? The answers to these questions may shock you!